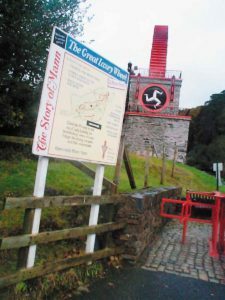 The advent of cheap air travel has reawakened interest in one of Ireland’s closest and oldest holiday destinations, the Isle of Man..
After a couple of decades of what might be described as a no-man’s island of tourism, culture, and the Scandinavian past in particular, are the new watchwords of the island. They don’t need a theme park in the Isle of Man, because the steam and electric railways tours of the island (£10 adults £5 children), and the horse drawn tram horses (all Irish horses, worked for four hours each day), create the impression that the entire island is one. The electric train wheezes its way northwards and anti-clockwise, around Onchan Hill electric train, past the hairpin bend at Groudle Glen which features in the landscape of every would be TT-motor cyclist’s imagination, through little picture-postcard villages, some of the rail stops straight from toytown with toytown names like Fairy House and Ballabeg, to the watermill at Laxley and the Miner’s Rest. The steam train takes you southwards, clockwise to cliff walks in Port Erin, and to the Creek in Peel, where customers ring their orders by mobile phone to the bar across the road and the barman comes smiling with the drinks..
Peel used to have Viking festivals, culminating in a grand finale with a chieftain sent off to Valhalla on a burning boat. DNA tests have show the people of Peel to be more Scandinavian than those of Norway, so it’s a relief they don’t enter the Eurovision. Nowadays a less raucous visitor centre recreates the mystical past. It serves as a reminder that while the east of the island looks east to the Victorian golden age, the west looks west to something altogether more invigorating. The museum in Douglas was opened by Elizabeth, the Queen of England. The centre at Peel by Mary Robinson in 1996. A room in the Manx Museum indicates that we share more modern heroes as well, the late Joey Dunlop guides visitors around the TT course with a haunting audio-visual display. Elsewhere the museum displays images from the heyday of Victorian Douglas in that museum in Douglas (well worth a visit, just to hear people panting from the steep climb up the hill as they arrive). The steamboats poured in thousands of miners to the resort for their bucket and spade boarding-house holidays. There was a Newcastle week, a Glasgow week, a Belfast week and a Dublin week, here to ride the steam and electric railways and sample the queenies, the famous smoked herrings purveyed by world-renowned firms like Devereau. The Planxty ballad about Macker’s adventure on the island seems distant in the new landscape, of a time before Christy turned to his heartfelt Hardyesque lyrics. It captured the spirit of its time, like the island has grown up, leaving the ballad and its makers behind. But in a new age of country house hotels, fine food, nightclubs, casinos, and the gentle chug of steam and electric train to boast about, the Crack is still ninety on the Isle of Man.